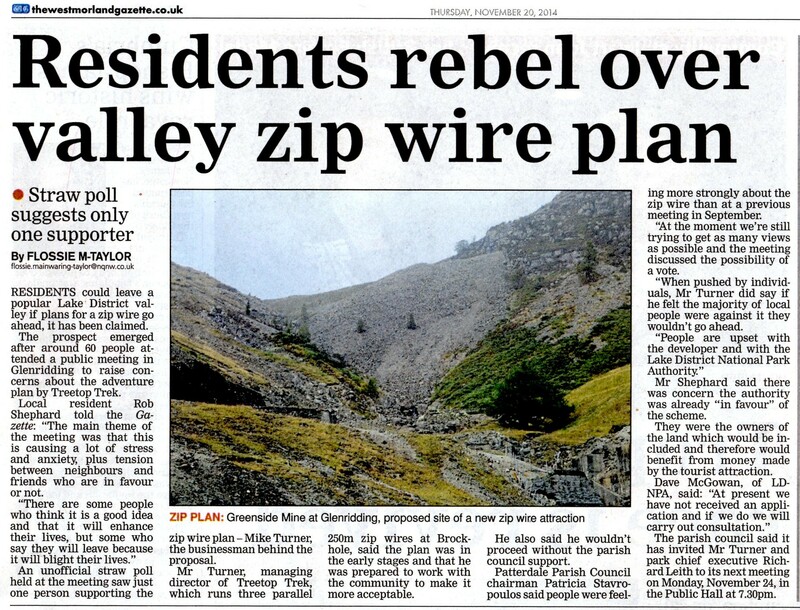 A company called Tree Top Trek (TTT) are proposing to install four parallel mile long zip wires above Glenridding and Ullswater, starting just above Greenside Mine and finishing in the fields just above Glenridding itself. The National Park Property Department have given permission for TTT to develop a planning application to install the lines on National Park land. The Chief Executive of the National Park, Richard Leafe, has publicly stated his support for this scheme, despite a very clear Planning Advice Statement from his own team outlining the serious concerns about the proposal saying the proposal is “unacceptable as a matter of policy principle” (see below). This seems to be yet another example of the clear conflict of interest within the Park between their stated aims of preserving the natural beauty and heritage of the Park and their desire to become more commercial and financially self-sufficient. Over and above the obvious environmental issues (the area proposed is a Scheduled Ancient Monument and includes both SSSI and SAC areas), the proposal also flies in the face of much local opposition, not least because it is likely to drive away many of the visitors who we welcome every year precisely because of the existing peace and tranquillity of the area. We also have a huge range of exciting and challenging outdoor pursuits on offer already for anyone seeking adventure. You can help us stop this proposal once and for all by getting involved. Please help us preserve the peace and tranquility of this beautiful area of the District for everyone , and as importantly protect the livelihoods of the people lucky enough to live and work there. There is only one certainty - if you do nothing then this WILL happen. 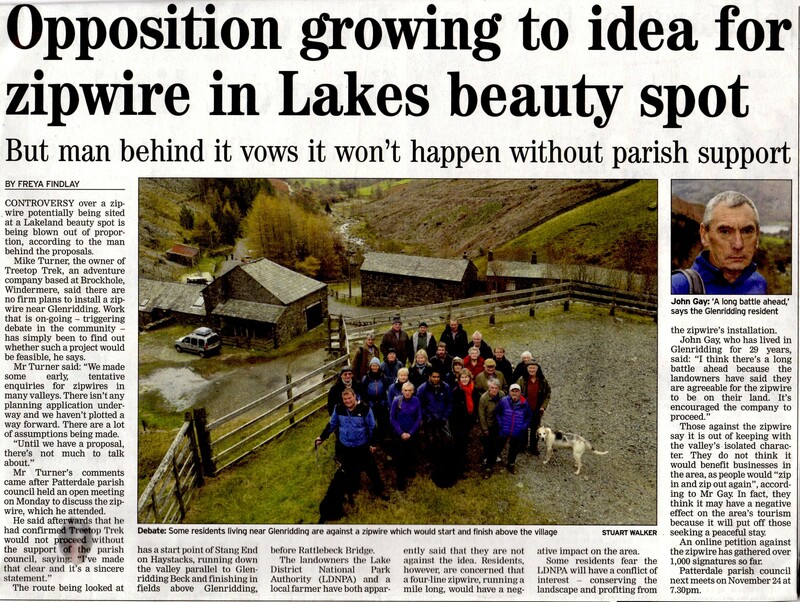 What’s So Special About Glenridding and Greenside? To quote the advice statement issued by the LDNP it’s “characterised by a strong sense of isolation, remoteness and tranquillity. The area has a very strong sense of tranquillity due to its openness and perceived naturalness”. It’s also a Scheduled Ancient Monument, SSSI, and SAC. Perhaps most importantly it is also where real people and their families live and work, and have done for generations. We’ve nothing against fun and excitement, and some of us would even consider themselves young. There’s already plenty of fun to be had in the valley. Try ghyll scrambling, mountain biking, climbing, trail running, open water swimming, sailing, and kayaking. You can also go on a zip wire already in the National Park at Brockhole, Whinlatter and Grizedale Forest. Won’t It Create Much Needed Jobs for The Locals? 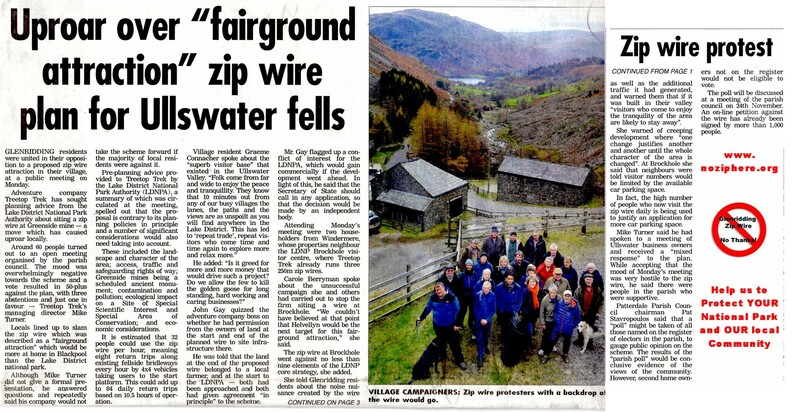 Of course the Zip Wire would create jobs. More seasonal, sadly low-paid jobs. However, it is also as likely to jeopardise many existing jobs in the area by reducing existing visitors - the people who come and enjoy the valley for days and weeks, shop in the local shops, eat and drink in the local pubs and cafes, and stay in local Hotels, B&Bs and cottages. Surely You’re Just A Bunch of NIMBYs! This beautiful area of the Lake District National Park is enjoyed by hundreds of thousands of people every year. They come here because it is as it is. Please let them continue to enjoy it that way. Chance For Change help hundreds of youngsters around the world every year to become more independent, increase confidence and take responsibility for their future by developing unique personal development programmes. 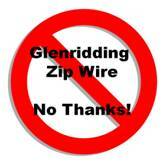 They operate from the Striding Edge Hostel at Greenside and may have to move elsewhere if this proposal goes ahead. Please don’t let that happen. 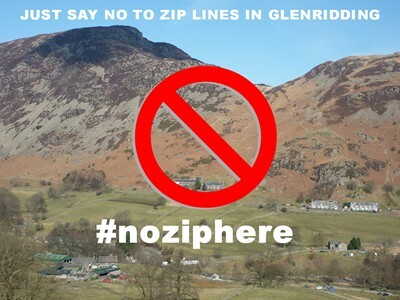 10th Nov - Handout presented at the Open Meeting on 10th Nov.
"Are you in favour of the proposed zip wire installations in the Glenridding Valley?"